What happened during our first year? How was HamQTH improved? 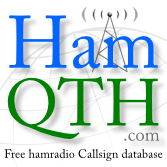 Information about new free ham radio call book was published on 29 of June 2011. After that, I got a lot of databases from users, who like the idea of HamQTH, and imported it. Thank to them, the database had more than 1 300 000 call signs. A month or so later, I created XML access for logging programs. First log, that used it was DFHLog from Jesus, EA7DFH. He was faster than me! After DHFLog, XML search supported also CQRLOG. Not so many programs, but it was the beginning. After another month I added Google map support. It is working very well and location is calculated from station address, not from grid square. Thanks to map position, HamQTH calculates azimuth and distance between you and the station and the sunrise/sunset as well. Also more programs implemented XML lookup e.g. LuxLog, WinEQF. I moved the database to another faster server. Web stayed on it’s original location. Another great feature I added a few weeks later - Recent activity. I wrote small program which is connected to RBN and DX cluster and collects all spots. I must say, it is a lot of spots! During CW WW CW 2011 program collected over 2.5 million of spots from RBN and DX cluster. It saves only recent 100 spots for every station, older spots are deleted. Right now, the database has over 4 million records and the number is growing. With Recent activity function I also modified the website and all labels can be translated into other languages. Today, the website is translated into 14 languages. On the beginning of October I created special ADIF interface for Logger32, added prg parameter to XML search and implemented internal XML search statistics. Since then other logs add XML search support for HamQTH e.g. Fldigi, UR5EQF log, MaxLoggerDX, RUM log, DXKeeper etc. On December I moved also website to faster server together with database which is growing very fast. Also added new function - log search. You can import your log, specify which fields and statistics will be visible and other users can use it. On March I speed up already very fast XML search, improved your own profile editing. Also worked on map improvements – you can choose if the map should be pointed to your QTH with coordinates from your address or you enter the coordinates by hand. This month HamQTH got new great feature – condition prediction. It calculates condition prediction between you and station you are looking for. The calculation accuracy also depends on your antenna and output power settings in preferences. All this is possible thanks to VOACAP online web site. I was very productive on March and also added support of slashed callsigns. You can create completely separated profile for your portable operation like OK2CQR/M or OK2CQR/P. So if you are looking for OK2CQR/M, you'll get my mobile profile. If there wouldn't be OK2CQR/M, you get OK2CQR instead. Very nice feature especially for operation from interesting CEPT countries. Also works with XML interface. April was not so productive like March but also added interesting feature – XML dxcc search. It uses tables from Martin, OK1RR which are excellent. It provides a lot of detail information about station you are looking for e.g. U3AP - you won't get only basic country information that it is EU Russian station, but also that he is from Gorod Moskva (MA), World War II. Veteran. The Martin's tables are the best I've ever seen. At the end of May HamQTH gets huge improvement – fully featured web DX cluster. What is probably unique, it can colour the spots according to QSO in your log uploaded to HamQTH! The default DX cluster page is configurable in your profile settings (filter spots by band, mode, continent and color for new country, new band country and new mode country). You can choose if you want to see stations only from band you are interesting in, or LoTW and/or eQSL users only etc. The DX cluster is very fast and also has telnet access (server: hamqth.com, port 7300). This month (June 2012) I was very busy so didn't added anything very interesting. Only did some design tweaks, fixed a few bugs and added page where you can send invitation to your friend. Finally, there are some statistics. Website has over 171 000 visitors, over 1 000 000 page views. XML access has over 2 732 000 hits. Callbook database contains 1 331 014 callsigns. HamQTH has 9 382 registered users. In log search database is stored over 4 000 000 QSO. Happy birthday HamQTH and a lot of new users!